I think I may just do a little office/studio tour as a four part series. One post for each corner. It’s a tiny office but it’s crammed to the rafters with “stuff” so there’s a lot to look at. There have been some new additions to my little office these last few days. The first of which had me doing little happy dances when he arrived. Please allow me to direct your attention to the handsome little guy gracing my top shelf. I’m told his name is “Wolfgang” and he was made by the insanely talented Lisa of “Stuffed Silly.” I don’t have enough words to express just how very much in love I am with my little Frost Monster. I would tell you to go get one of your very own, but I think he was the last one in the limited edition series. Lisa tells me that she has other “monsters” planned, though. So I encourage you to check back in to her store later on to see what she’s been up to. The second “new” thing to spring up is right under him and above the bottom shelf. Up until yesterday, I had a poster hanging there for a band that I was friendly with in L.A. but, if I had to be honest, never ever listened to. They were all very talented musicians and really nice people—their music just wasn’t my particular cup of Celestial Seasonings. I ordered this gocco print from Jose Pulido’s shop a few months ago and never found a place for it. So, when I caught myself wishing that I had more wall space yesterday, I realized that “nice people” or not, that band poster was taking up valuable space and had to come down. I couldn’t be more pleased with the change. 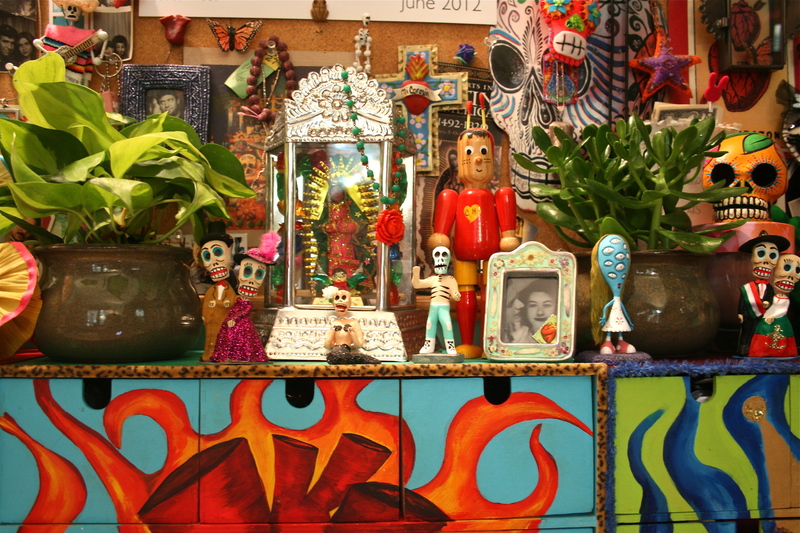 Pulido’s calaveras never fail to bring a smile to my face. They all have such a wonderful sense of joy and humor about them. These are qualities that I struggle to bring into my own work. It’s funny, I’m always so drawn to things that are whimsical and light-hearted and so much of my own work is so… (for lack of a better word) “serious.” I’m hoping that Pulido’s gocco print will inspire me to bring some of that whimsy into the things I make. 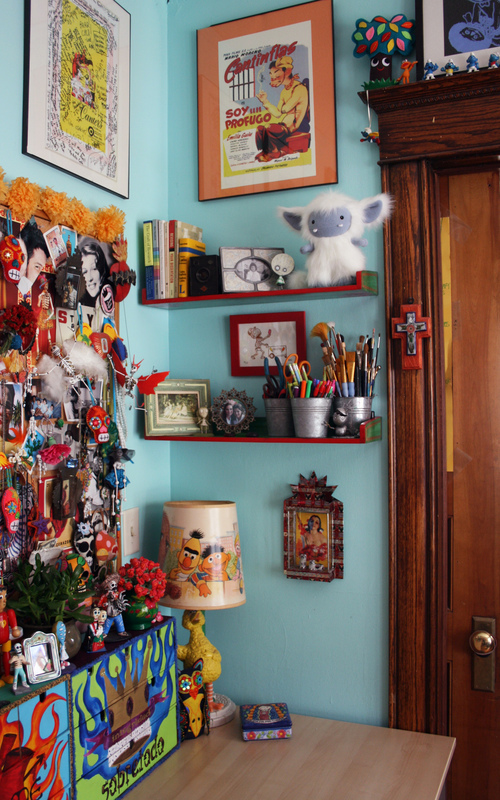 At the top right of the picture (sitting on the door frame) you can see a modified Little Odd Forest “Treeling” made from the pattern featured in Therese Laskey’s “Softies.” The original eyes were Freaking. Me. Out. so I gave him a set that weren’t quite so… ah… “intense.” The pattern is also available as part of The Softies Kit. If you’re just starting out, the book is a nice resource to have. I found it really useful in some ways. To the left of Wolfgang, you will see “Brie Boy” (another Tim Burton toy), a photo of my mom at about five years old, a vintage camera brought back for me from Indonesia by my dear sweet cousin James and a handful of books designed to help me research a dissertation, edit a dissertation, write a dissertation, format my dissertation, etc. You can see that they are all collecting dust. Below Señor Wolfie is an area of the office that sees a lot of traffic. 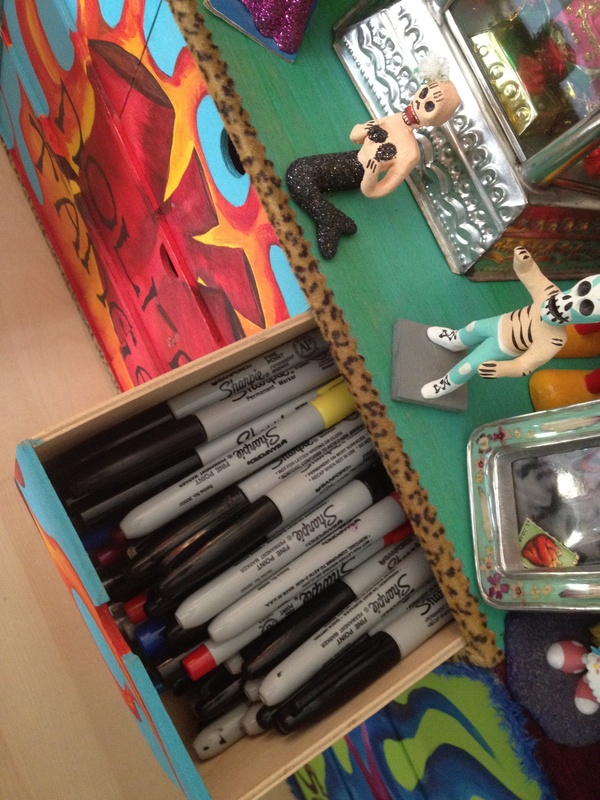 I jump up to grab scissors, pens, pencils, or paintbrushes from this shelf several times a day almost every day. This shelf holds two more Tim Burton toys—“Staring Girl” and “Robot Boy.” They’re everywhere. I sort of get a kick putting them places where they blend into the background. Framed, at the top left of the photo, is a menu from Canter’s Deli in Los Angeles. To this day, I have no idea who had the idea to pass it around, but it was presented to us (Glen+me) at our going away party [Held at Canter’s Kibitz Room, natch]. I doubt it contains a single sober signature. (Please don’t tell the nice folks at Canter’s that we have this. It’s been years, but I’d hate to get anyone in trouble—or get myself 86d. Hi, Bella!). Cantinflas. If you don’t know, you’d better learn. The Big Bird lamp has been with me since I was three or four years old. When the lampshade ripped in a college-related move, I was heartbroken. I found a replacement on Ebay six or seven years ago. So, two things: (1) What can’t you find on Ebay? And (2) Why do we get so attached to artifacts from our childhoods? As long as I’m plugging IKEA [I swear that this isn’t a sponsored post], the shelves on the wall are IKEA, too. I have no idea what they were called. I only remember that they were lightly lacquered and required a fair bit of sanding (grrr). 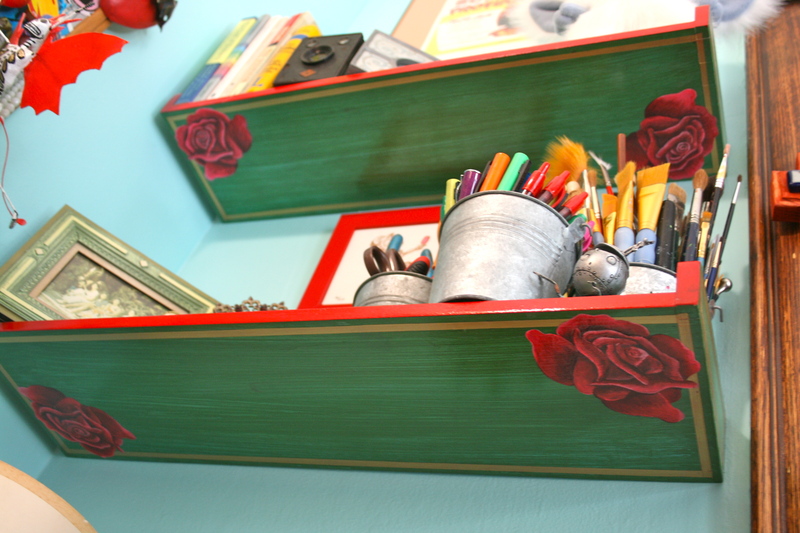 And, because I am Head-Chicana-in-Charge of details that no one but me will ever notice, I painted roses on the underside of each shelf. You may think that it was a big old waste of time to do this—but I assure you that when I am sitting at my desk and I look up, those roses are right in my sight line. I enjoy them Every Single Day. Totally worth it. I won’t begin the year self-flaggelating by saying that I am the “worst (craft) blogger in the world”… but I will admit to perhaps not being the most attentive. I’m glad that blogs aren’t people with feelings because this one might start to feel a little neglected. And the less said about my Twitter account the better. If Twitter were a person, @AndCorazones would be dying of loneliness and talking to itself while rocking in a corner. It should go without saying at this point that I’m not the most media savvy person around. That said, it should also come to no one’s immediate surprise that I managed to travel 1,933 miles home for Christmas WITHOUT A CAMERA. “Surely,” I reasoned, “someone at home would have one that I could borrow.” Alas, in this age of cell phone cameras, that turned out not to be true. 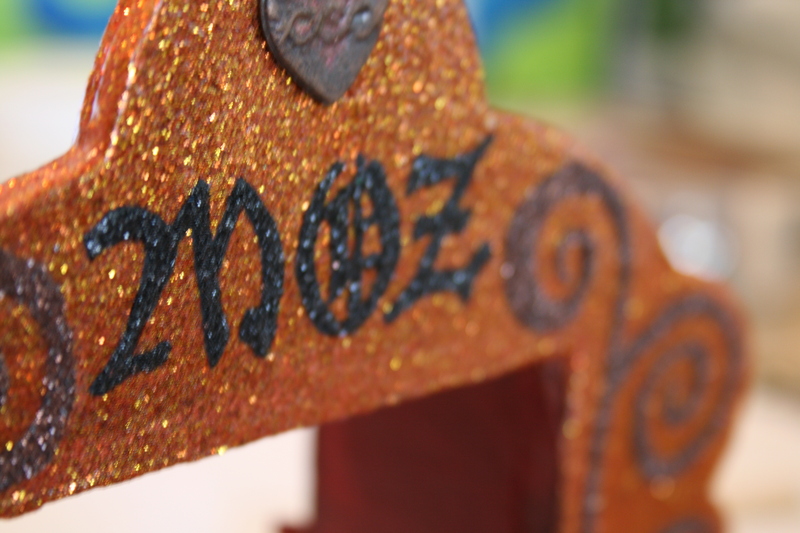 And really, what’s a craft-blog without pictures? So there you have it folks: my sad, pathetic reason for not updating this space in so long comes down to my inability to pack even the smallest of digital cameras into my suitcase. 1. 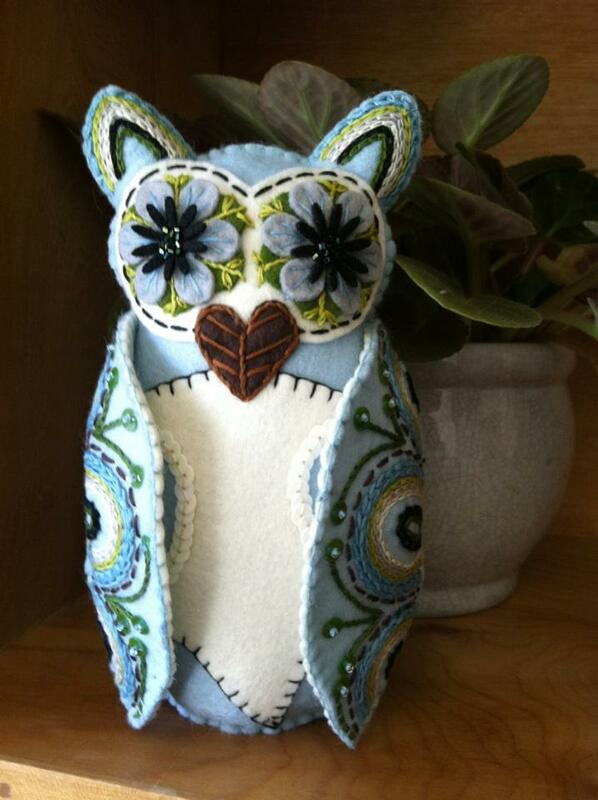 I never get as much done as I think I will when I go home, but one of the things that I DID finish was this little blue and white owl. He (She? I think Renata might have decided that it was a girl-owl) was a New Year’s gift for the aforementioned lovely with the iphone. The body was constructed entirely out of 100% wool felt– which was really a pleasure to work with– and trimmed with vintage beads and some new sequins. 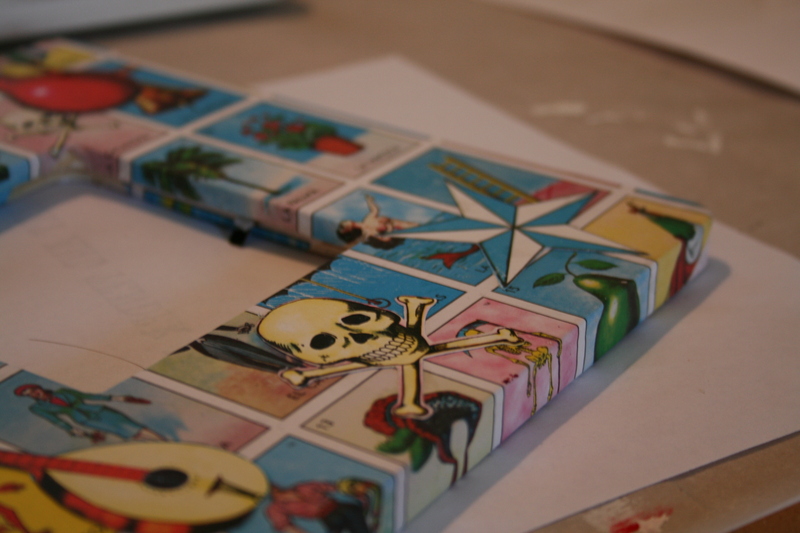 The Morrissey Nicho is (finally) in the store and so are LOTERIA FRAMES. I don’t know why those little frames are making me so happy, but they are. I sent a bunch of packages out today and did some surprise gift wrapping for my customers. I feel more Christmas-y already. Looks good enough to eat! 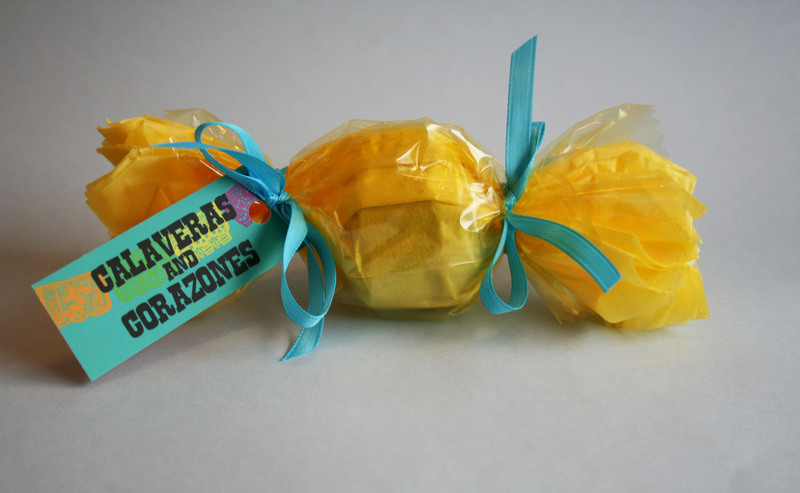 Little tins are leaving the shop looking like hard candy. Yum! There has been NO sun today. None. Had an exciting week in the shop. Thanks to friends tweeting and reposting, the old storefront had its busiest day ever. This little guy (girl?) was especially popular. People were linking to him from countries with alphabets I don’t recognize. You never know what people are going to like. I was sure that people would be all over that little grey owl that my Glen has been drooling over, but no… the red owl has gotten all of the love. It sold in less than an hour. I’m thinking of making another one… We’ll see. If everything proceeds on schedule, I’ll have some new things in the shop tomorrow. This “craft blogging” thing is a lot harder than I thought it would be. Who has time to make things AND write about making things? Well… I guess lots of people do. These people clearly have far better time management skills than I do. Obvio. I’m hoping to finish a Monarch Nicho for a customer today so that it can go in the mail on Tuesday and I’m working on simple little frames for the shop while things dry. The “Sweet and Tender Hooligan” nicho will be ready by tomorrow, too. That sucker’s been on my desk for over a month now. It’s time it found a new home… hopefully with someone who has a penchant for pompadours and obscure literary references. I’ve already said too much. A bright red owl should be joining his compatriots shortly and I’ve got a few more that are in the cutting stages that I’m really excited about. I purchased the loveliest felted wool last week and the stack is sitting on my desk just waiting to be turned into something special. I’ve never embroidered on anything with that much stretch, so I may have to invest in some stabilizers… can’t wait to see what happens! Hoot, hoot, hoot! 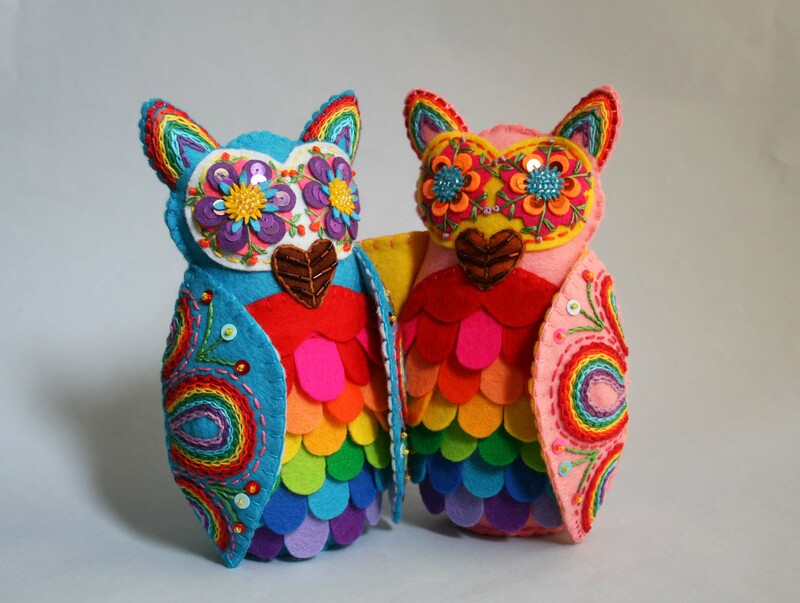 Owls are on the way! I bet that you already knew that a group of owls is called a “parliament”… but did you also know that you could call them a “wisdom?” A wisdom of owls… sounds very Harry Potter. I’ve had these little guys cut out for quite some time now and I’ve finally gotten around to sewing them up. I’m always surprised by how much the things I make change from initial cut to final stuffing. What works in the planning and plotting stages doesn’t always feel right once you start adding embellishments, etc. The lovely Joni at Sugar Sugar was kind enough to carry my sugar skulls in her shop this October and she asked me if the skulls told me when they were “done.” The question took me so off guard I didn’t know what to say at first. Before you call the men in the white coats, let me assure you that I don’t actually hear these little scraps of felt talking to me. But, when something I’m working on starts coming together, it lets me know whether or not I’m heading in the right direction with it. And if I’m heading off in the wrong direction… well… let’s just say that I have two or three unfinished skulls that have been sitting on a tray for the better part of the last four months. They’ll let me know when they’re ready, I’m sure. 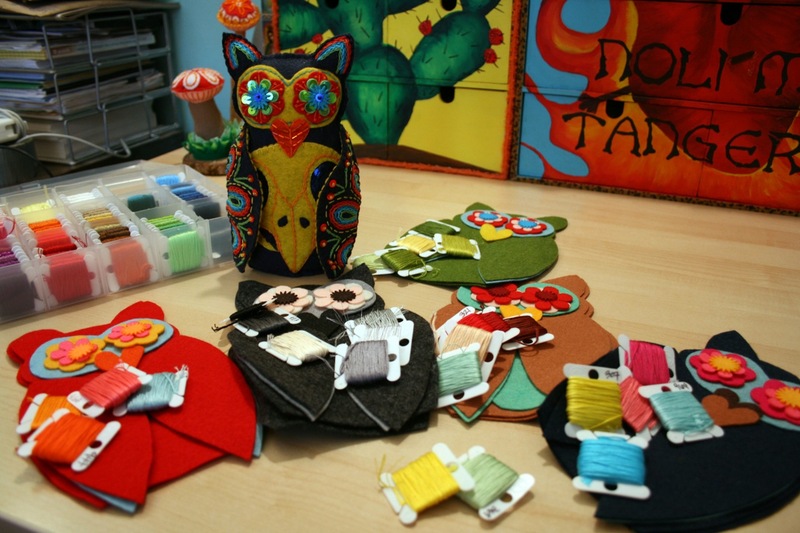 These owls are coming along nicely and should be ready for the shop any day now. They each take about two full days to complete as they’re fairly labor intensive (and I sew painfully slowly), but I’m hoping they’ll go by a little faster after I’ve made a few more… and they become a little more vocal about what they want to look like. Hoot!